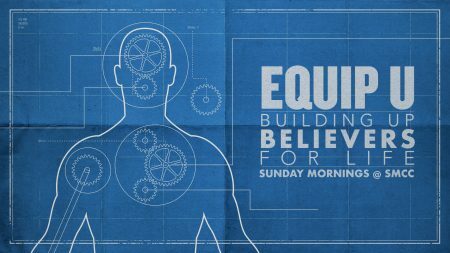 Equipping Classes meet each Sunday at 9:15am. The following Equipping Classes began on April 7, 2019. (Upper Room) The Fruit of the Spirit – The Fruit of the Spirit is often referred to among churches and in preaching and teaching. It is assumed that we are very well aware of subject and context. We will spend time in this class explaining the How and What. How does one attain or produce the Fruit of the Spirit? And then What are the Fruits of the Spirit as to definition and practice. This class is for everyone, and will be very practical as you strive to live Christ. Bob Nilsen Room 358 Apologetics: An interactive study on the substance and process of giving a ‘ready defense’ of the Christian Faith. A combination of traditional apologetics and personal apologetics in our current culture. Come ready to be taught, to interact, and to contribute as to how to best reach those in your circle of influence. Be encouraged that the faith we hold dear is founded on reliable texts, sound scientific principles, and reasonable philosophical arguments. Shane Hudman Room 312 Drawing Near to God – Have you ever had a spouse or child try to speak to you from another part of your house? It seems to happen to me all the time. And it’s pretty difficult to hear. I usually don’t fully understand what they’re trying to say. It’s much easier when they are closer. I believe the same is true in our relationship to God. We will hear Him more clearly the closer we are. But how does that happen? How do we get closer? James 4:8 gives us a promise. If we will draw near to God, then He will draw near to us. That’s an incredible statement. The Eternal God will draw near to me…draw near to you, if we will first draw near to Him. Over the next couple of months, we’ll be exploring what it means to draw near to God. We’ll look at the Discipline, the Distractions and the Dangers of not drawing near. I hope you will join us. It’s an informal study that will encourage us as we seek to draw near to God. Steve Meeks Room 356 Revelation – Babylon has fallen and is no more. The Anti-Christ, the False Prophet, and their armies are defeated and thrown into the lake of fire. Then Satan the dragon of old will be locked away for 1000 years, and the world for the first time since the fall of creation will know perfect rule as it is led by the King of kings and Lord of lords. After the millennial reign of Jesus Christ, He will bring Satan out of captivity and, along with the men of earth, the enemies of God will be defeated forever in one brief battle and will forever be in the lake of fire.Here is John’s description of what God has in store for those who love and worship the Lamb… “Then I saw a new heaven and a new earth; for the first heaven and the first earth passed away, and there is no longer any sea. And I saw the holy city, new Jerusalem, coming down out of heaven from God, made ready as a bride adorned for her husband. And I heard a loud voice from the throne, saying, ‘Behold, the tabernacle of God is among men, and He will dwell among them, and they shall be His people, and God Himself will be among them, and He will wipe away every tear from their eyes; and there will no longer be any death; there will no longer be any mourning, or crying, or pain; the first things have passed away.’” And He Who sits on the throne said, “Behold, I am making all things new.” (Rev. 21:1-5) Come quickly, Lord Jesus, come. Lighthouse Community Chapel This group is composed primarily of mid- and senior adults, married and single. Typical teaching consists of a study of a specific book of the Bible, with occasional topical studies. The class is taught by Eric Dennison. Abounding Room 359 This is a small group, taught by Larry Laatsch, whose members range in age from 40’s – 60’s. Biblical teaching focuses on practical life application.